This story has been updated (see bottom). Sometimes things work out just about perfect. That’s not always the case when it comes to music matters, including the transactions that see the ownership of legendary venues changing hands in hopes this history of the establishment will be respected by the new regime. Have you stepped foot into Tootsie’s Orchid Lounge on Lower Broadway in Nashville recently? I didn’t know Def Leppard played such an integral part of that venue’s legacy. But you can put any concerns away that the historic Cheatham Street Warehouse in San Marcos, TX will either be razed or turned into a Karaoke Bar anytime soon. 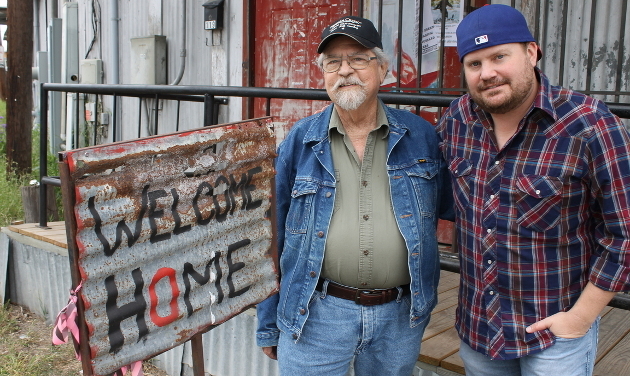 Randy Rogers of The Randy Rogers Band has purchased the property from the heirs of the founder and owner of the building, Kent Finlay, who passed away in 2015. We’ve all heard of the “Class of ’89” in country music. That was the year that Garth Brooks, Alan Jackson, Clint Black, Travis Tritt, and others came to power. Well have you ever heard of the “Class of ’87”? That was the year Todd Snider, James McMurtry, Bruce Robison, Hal Ketchum, and Terri Hendrix all played regularly at the old wood and tin music venue in San Marcos. Kent Finlay’s “Class of ’87” is just one part of the legacy of the Cheatham Street Warehouse. George Strait, Randy Rogers, and Stevie Ray Vaughan all used the support of the venue that was originally opened in 1974 to help springboard their careers, and to a man they would tell you how important Kent Finlay and the Cheatham Street Warehouse were to their careers. Jenni Finlay co-authored a book about her late father and the Cheatham Street Warehouse Kent Finlay, Dreamer: The Musical Legacy Behind Cheatham Street Warehouse with Brian T. Atkinson released earlier this year accompanied by a tribute record. And now nor will the rest of us as the history of one of the most important venues in Texas will not only be preserved, but allowed to continue forward into the future thanks to the patronage of Randy Rogers. UPDATE: Some additional information has been released about Randy’s plans with the iconic venue. Randy is planning to keep the character of the Cheatham Street mostly in tact, but there are plans to add a permanent patio to the venue, and to add food service. Rogers has also partnered with KRR Entertainment, an Austin based event production company that co-founded Lone Star Jam and produces events at the Nutty Brown Amphitheatre, to ensure the venue continues to provide a top notch environment for both artists and fans. This is great news. I was wondering how CSW would survive without Kent, it’s hasn’t been the same since his passing. With RR at the helm, this little shack by the rail road tracks will live on and not be turned into condos like we are seeing around Austin everyday. IMO, CSW is a historical marker for not only tx music but for its contributions to all music. If you have a song that is orginal, you can play at CSW. Stories of Guy Clark playing into the early morning hrs and not a single person leaving. George starting his career and Kent driving him to Nashville in the yellow van. The list goes on and on but what all the these artist have in common, Kent Finaly and CSW gave artist a place to grow and craft their art. Mr Finaly has done more for country music than many people know. RIP Mr Finaly and long live Cheatham Street Warehouse. I am still fairly new to visiting San Marcos, as my brother moved there a few years ago to teach college, but I have gained an appreciation for Kent Finlay and the whole Texas music scene. The Kent Finlay tribute CD is very enjoyable. Good for Randy Rogers ! In celebration, hopefully RRB can re-release that first “Live from Cheatham Street Warehouse” album. Glad to know this legendary venue is in the hands of someone with such an important connection to it and who will keep it running with a strong sense of tradition. Aww man, now that is just cool as ****. I was working in San Marcos few months ago, it’s my dream retirement. Now hopefully good country music will always reside there. Randy must really have his ducks in a row now. What’s really a dann shame is they’re doing that and Houston is reopening Gilley’s but as a chain. Man I wish the music scene would do something in Houston. Now I really, really like Randy. One night some years ago in Nashville, at the Ryman. It was the Americana Music Awards. By pure dumb luck I was seated right next to Kent Finlay. Could not have asked to share the evening with a nicer man. Being a fan of Todd Snider I had heard many stories about the man thru the years.I felt I was in the presence of a legend..& I was. He told me some great stories that night. I was so sorry to hear of his passing & am glad Cheatham Street will ive on. Thats awesome, he truly was a special person, very humble and genuine. I went to school at Tx State and would go to CSW as much as possible. Kent Finlay could be found at the end of the bar every night and would talk to anybody that cared to ask him a question. He was always so welcoming and appreciative for coming to his bar and listening to the music. After I graduated and moved, I was passing through SM with what is now my wife so I took her by CSW to see it, it was about 1PM on a Friday (they usually weren’t open this early). I noticed the door was cracked open so my wife and I walked in and we looked at the place from the front door. There was a bartender stocking up the bar and there was Kent Finaly doing paper work at the bar. I asked if it was ok to show my wife around and he politely introduced himself to my wife and said sure. We sat at the bar and he let us order some beers and we talked for about 2 beers worth of time. Those moments are what I remember about Kent Finaly and CSW. Yes, the music is great as always but it was the homely atmosphere that made CSW unique. I believe RR is the perfect person to keep this same spirit alive. This is awesome news. I have no doubt Randy Rogers will keep it from being leveled and paved.